President Emmanuel Macron has condemned the violence that rocked Paris and other cities in France this weekend, as over 75,000 people took part in the third Saturday of the Gilets Jaunes movement. 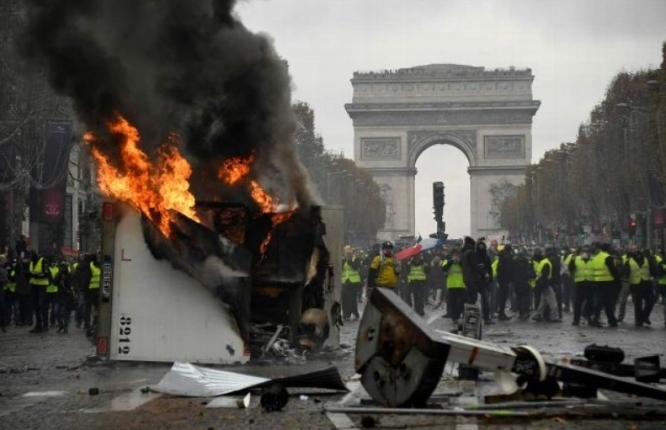 On Saturday November 1, the latest reported figures say that 133 people were injured and over 412 arrested in the capital - with 378 taken into police custody - after violence erupted in several districts during ‘Gilets Jaunes’ demonstrations, including near the Champs-Elysées. One man is reportedly in a coma after being severely injured by a falling fence near the Tuileries. Cars were torched - including at least one police vehicle - while shops and restaurants along high-end streets - including in the Opéra neighbourhood, Avenue Foch and Rue de Rivoli - were ransacked and smashed. Anti-government graffiti was sprayed onto walls and monuments including the Arc de Triomphe. In the town of Puy-en-Velay in the Haute-Loire, government buildings were set alight as protesters threw “Molotov cocktail-style projectiles”, while around 30 people were injured in scuffles in the centre of Tours (Indre-et-Loire). There were 10 arrests in Meurthe-et-Moselle (Grand Est), and seven people were arrested in protests around Dijon (Côte-d'Or). Other demonstrations turned violent in Bordeaux (Gironde), Toulouse (Haute-Garonne), and Nantes (Loire-Atlantique), while a péage booth in Narbonne (Aude) was completely destroyed by fire. Mr Macron is now expected to hold an emergency meeting today after his return flight last night. The minister for the Interior, Christophe Castaner, condemned the violence as “a professional strategy of disorder”. He confirmed that by Saturday night, the situation in Paris had eased, although had not been “totally secured”. The Agence-France Presse has dubbed the events as “France’s worst urban riot in years”. Despite the violence, many protests continued peacefully, with some Gilets Jaunes blocking roads without incident, and others simply playing loud music on major roundabouts to make their presence felt. A new group of representatives for the movement have called for a “conversation” with the government. 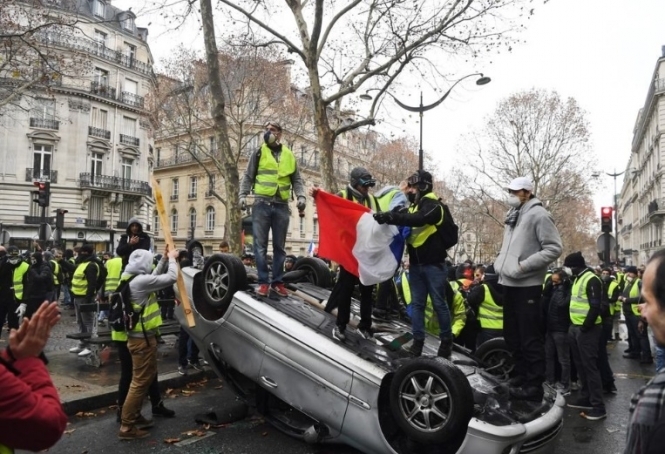 In an open letter published on news website Europe 1 le JDD, 10 figures including Brittany resident Jacline Mouraud and Toulouse resident Benjamin Cauchy sought to distance themselves from the violence, calling themselves “the Free Gilets Jaunes”. They called on the French public to continue to support the movement and demanded a “viable, credible and responsible project” that would allow the government “an exit door from the crisis”. In particular, they have called for a meeting with Prime Minister Edouard Philippe, as well as a national conference on taxation, a freeze on all fuel tax increases, and the cancellation of the planned increase in cost for vehicle MOTs. Mr Cauchy said: “Since the beginning, we have been spearheading serious changes. We do this with respect for the institutions of the Fifth Republic, and for public order, and people’s wellbeing. [But] we are waiting for a political electric shock [and] we want to be the spokespeople of a constructive anger. Facebook Groups claiming to represent the Gilets Jaunes movement have also distanced themselves from the violence this weekend, but have called for more protests next Saturday.